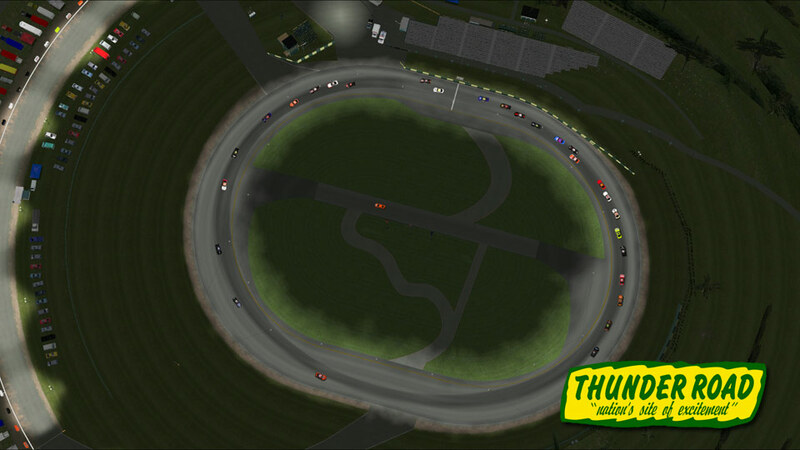 Project: Short Tracks is proud to present “Thunder Road International Speedbowl” a ¼ mile high banked bullring with fully working pits and A.I. for 30 opponents. 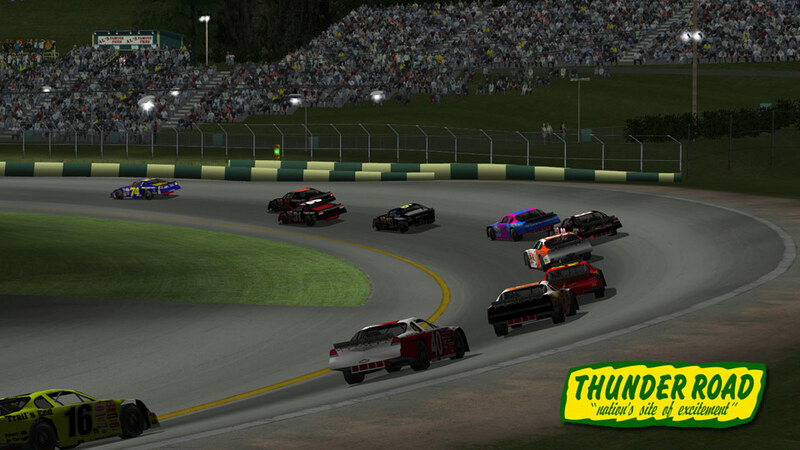 Once again, the “PST Team” has come together to bring you not only another recreation of one of America’s most popular and successful short tracks, but one of the most detailed short tracks ever created for NR2003. Thunder Road has been operating since the 1950's and has been packing in the crowds with thrilling short track action and excitement. 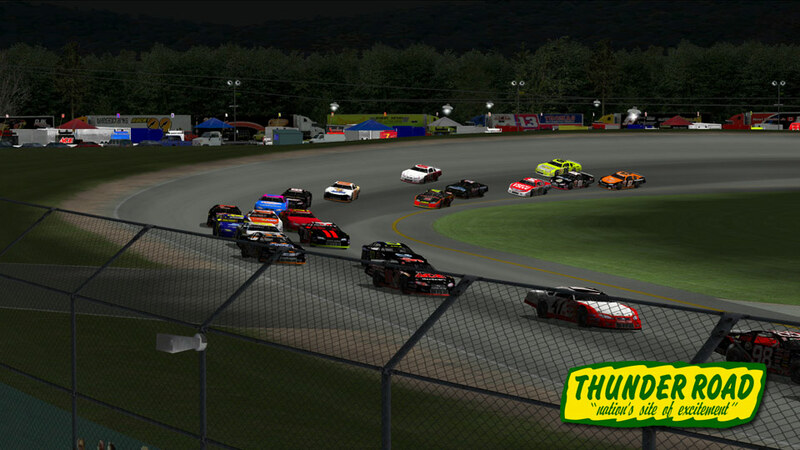 Nestled atop Quarry Hill in Barre, VT, the popular Green Mountain State Speedbowl features weekly racing on Thursday nights showcasing the Late Models, Tiger Sportsman, Street Stocks, and Junkyard Warriors. A high point occurred in 1997, when TNN televised a NASCAR Busch Grandnational North race to a national TV audience casting a spotlight upon one of America's great little short tracks. Today, the track hosts 3 visits by the prestigious American-Canadian Tour (ACT) Late Model Racing Series including the season finale "Milk Bowl" which is run in 3 segments with the winner fulfilling a 48-year old tradition of kissing a cow in victory circle (you won't have to do that though). This NR2003 version of Thunder Road is an attempt to closely resemble the track as it appears in its current state. It is not, however, an exact replica, nor do the limits of NR2003 allow it to be. This project represents the culmination of over four years of work from many contributors. 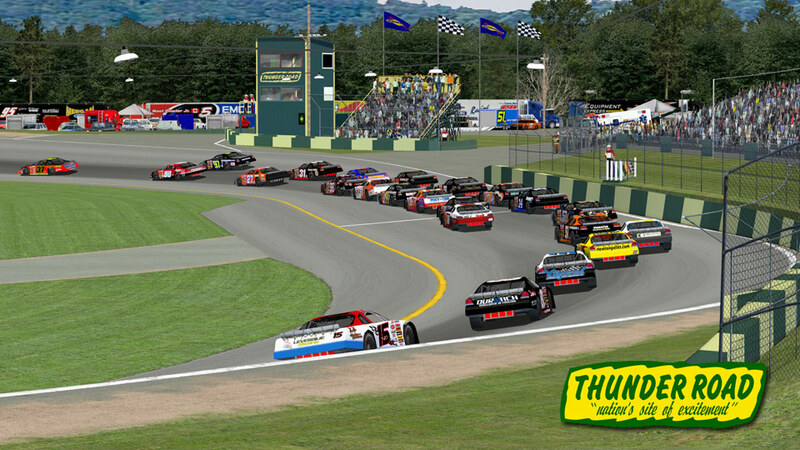 It is a tribute to all of the many fans and competitors who love and visit Thunder Road and stands as a small replica to help them relive the great door-to-door, beatin' and bangin' action of one of New England's and the country's most beloved tracks. IMPORTANT IMFORMATION REGARDING THE A.I. We also made an effort to get the A.I. to have an occasional random wreck that would bring out some cautions to further enhance the realism. In trying to achieve this, we first went through the entire track and made sure that the proper surface designations were in place to allow for cautions when wrecks and spinouts occur. In addition, we had to "push the envelope" a bit with the settings in the track.ini. This required getting the A.I. to race a little tighter, change lanes and be a little more aggressive. As a result, the end user may experience an early wreck or 2 between the A.I. at the beginning of a race. This is because at the start of a race, the pack is at its largest and tightest. Testing revealed that once a couple of early wrecks occurred, then the A.I. seemed to settle down and spread out. However, once another random wreck occurred, the restart would re-tighten the pack and as the saying goes....."Cautions can breed more cautions". Kind of like real life racing! 1. J.R. Franklin: Overall project development and coordination, graphic detailing and immersion, object editing, textures, horizons, start grids, Lps, AI (Artificial Intelligence, i.e. the computer controlled cars), surface grip levels, cameras, quality assurance and testing. 2. Ian Smythe (Smiffsden.com): custom 3do object modeling, texturing, horizons, cameras, troubleshooting, quality assurance, beta testing and overall general assistance and consulting. 3. Carl Sundberg (Riviera71): custom 3do object modeling, texturing, general assistance and consulting. 4. Aaron Maynard: Creator of the original base track built via Butter's Rule specifications, Lps, surface grip levels, default fast setups, quality assurance, beta testing and general consultant to the project. 5. Wayne "Bowtie" Anderson: custom 3do object modeling. 6. Matt Gilson: texturing of race car objects, miscellaneous tree objects, quality assurance and beta testing. 7. Wayne Faircloth: Racing setups consultant. 8. Robin "Amtronic" Tice and all of the guys in the NR2k3Tracks.com Editors forum: beta testing. 11. Denis Rioux: 1970's hauler objects. 12. Ron Fox and Falcongrafx.com: fictional short track and NCTS haulers. 13. The makers of Nelson Ledges for NR2003 from which we borrowed select tree objects. 15. NR2k3tracks.com for their help and support. 17. To anyone else whom we may have unintentionally neglected to mention but contributed in the creation of objects that have been borrowed from other NR2003 tracks for this project, we sincerely apologize. 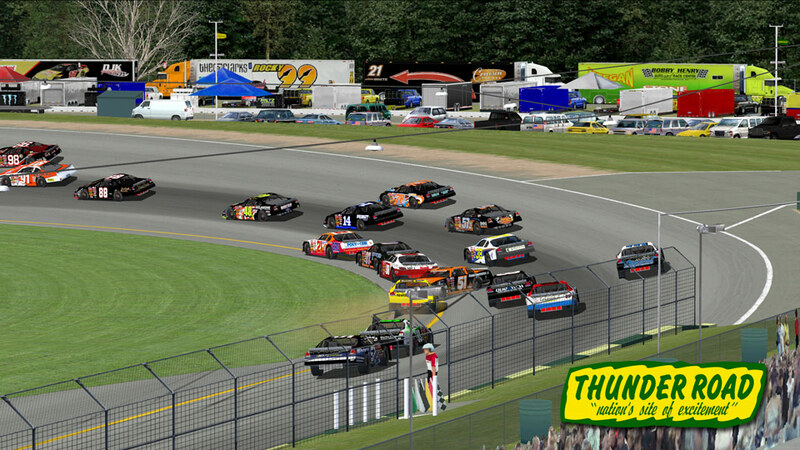 Although you were not mentioned individually, your contributions to NR2003 and this track are greatly appreciated. 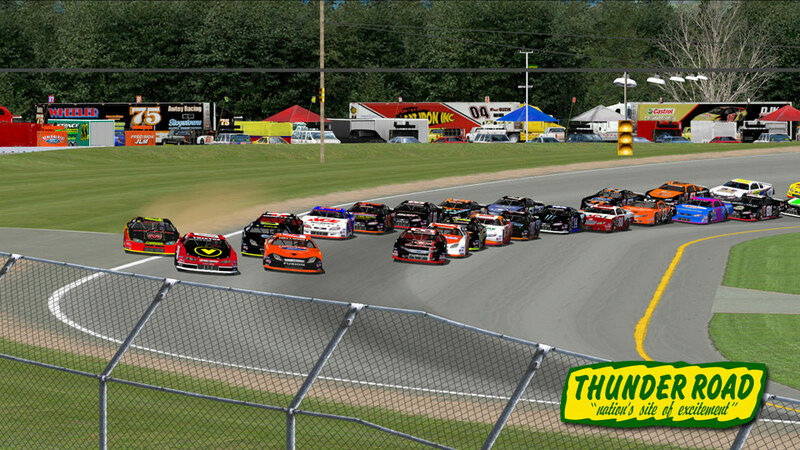 Be sure to checkout NR2003 Tracks - http://www.nr2k3tracks.com for all your up to date Nascar Racing 2003 Season mods and tracks, please report any issues with the track in the Thunder Road forum thread there. 7zip Archive contains both DAY and NIGHT tracks.